I keep saying it, over and over, to anyone who asks and those willing to listen – I can’t do 4 walls again. Although I don’t know everything about my future and I reserve the right to change my mind, after 2.5 years of living in Darwinny our Motorhome, I love it so much I don’t want it to change for my foreseeable future. Adele is happy either way, she loves this life but could also go home. I think that’s mostly because she misses her Mum a lot and wants to be close to our sons Matt and Cameron. During our time back home, we just had 4 months in Brisbane, we had lots of times where we were invited to friend’s places, sometimes even offered a place to stay. On a number of occasions, we received text messages from friends “I’m away for the weekend, the spare keys are under the mat, go relax in a bed and use the pool for a few days”. We were so grateful for their offer and thoughts for us. Plus, we love that we have so many wonderful and kind friends. When we did a housesit for my niece, it was awesome, beautiful pool, nice home, Foxtel, heaps of room to park the Motorhome. It was perfect, except I found within just a day or two I was back doing what I used to do, sit and watch TV, stay at home and not be productive. I wasn’t LIVING!! We visited family and friends in their homes and all I see is “stuff”. The same stuff we used to have. All those possessions I thought that made me happy. Every now and then you’d blow off the dust and get a broom to the cobwebs and use my “stuff” again but for the most part it would just sit there doing nothing. Just money wasted which made us believe we needed to go back to work again week after week to fund the life everyone else has and we were copying. Our friends and family may read this but I’m sure they’ll understand the context of what we mean. We discussed this with them anyway. While we passionately respect and love our family and friends, a house just isn’t where we’re at any more. When my Dad passed away I found myself asking the question “there has to be more to life than work and do chores”. We really miss our Mums, both of us have lost our Fathers now, and we miss our sons Matthew and Cameron. Also we miss our friends. I miss playing cricket and all my mates. It’s not easy to just pack up and leave and it’s even harder to stay away. For me, my entire life of 51 years before we left was lived in Brisbane. I grew up living in the same family home, we didn’t move house even once, until I was married. Adele had lived in different places and moved around different homes, but I hadn’t. Therefore, I was very used to routine and stability. Given my personality that was probably a good thing. We recently spent 4 months in Brisbane and the South East seeing everyone we could, pushing my business and exploring places we had never seen in our own “backyard”. I didn’t enjoy the traffic being back home in Brisbane, the hustle and bustle doesn’t do it for me now, but it’s still home and our Family are all there. Brisbane is home and always will be. 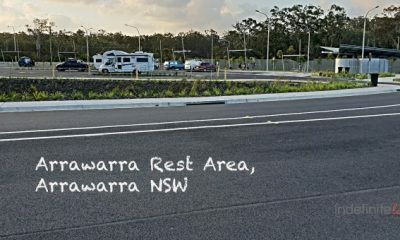 During this time back in the City was when I realised I yearned for things I learnt to love when road tripping around Oz. 3 specific things stood out that I missed. Nobody at home talks about seeing an amazing Sunset. There’s something special about them that we just love. The colours, the differences when there’s a cloud or fire in the distance, the different views across oceans or rivers, over barren land and between mountains or ranges. Sunsets can be so different yet all so spectacular. We just don’t appreciate them at home. Cooking over an open fire, sitting around it with a Rum in hand and chatting to new friends, seriously, does it get any better than that. I love waking up in the morning, getting the coals fired up again and cooking some bacon and eggs. Lighting a fire in downtown Brisvegas is a sure fire way to upset the neighbours and have the local Council issuing a huge fine. While settled in over that fire at night, it’s so wondrous to look up and absorb the big picture. Who am I, why am I here, what else is out there, what would it be like to go to the moon, how amazing is life and how our planets work. I really enjoy looking up to the stars at night, imagining a life where I get to choose my tomorrow. Yes, don’t box me in. 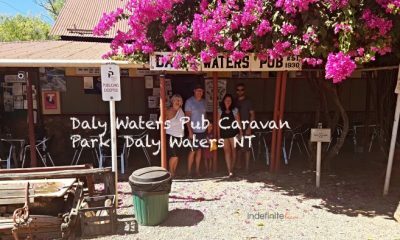 Did I mention, I can’t do 4 walls…..
10 Reasons to Travel Australia Instead of Going Overseas. Love this article. We are very similar thinkers to you both. We don’t want to be a slave to our house. You have made it clear to us that we have made the right decision to just do it! Can we afford it? Probably not, but we’re doing it anyway. Thanks Kev and Adele. There’s a major story that we have never told, but a lot of time has gone by and I feel the time is now right. The air conditioner on our Motorhome caught on fire. You know, flames from the roof, bellowing smoke, fire brigade, campground jam packed with hundreds of people all around us and Adele inside the Motorhome while the roof was alight with flames and smoke. It was Easter Friday 2017. Earlier to this, we had been to Kangaroo Island in South Australia and arrived back on the mainland a few days prior and went straight to Rapid Bay Campground. Our YouTube channel has a video of the campground when we arrived and another the day of the fire. 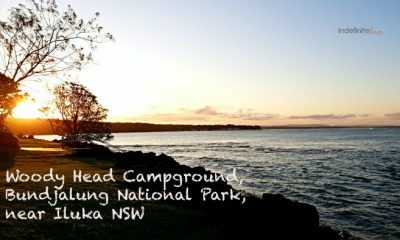 We were told there were 900 people camping there over Easter. It was as simple as I plugged in the Generator and started it. Whenever we plug into electricity the Air Conditioner unit goes on standby and the standby light comes on, it’s our way of knowing the power is connected, but on this occasion Adele was inside and heard a fizzing sound and there was no light. She came out to tell me what she heard so I went inside myself to see why the light hadn’t turned on. I checked the unit and tried manually turning it on but nothing. Then I tried the remote control, still nothing. Next minute absolute mayhem as someone came running over yelling to us we were on fire. As you can imagine, it was immediate panic and the following few minutes are a blurr now looking back on it. Immediately I raced to the back of the Motorhome and climbed the ladder to see flames coming from the air conditioner unit. Someone had already unplugged the Generator and raced away from the Motorhome with it to take that risk out of the equation. I quickly asked for my 20L container of water to put out the fire when someone yelled out not to put water onto an electrical fire. I’m glad someone was thinking common sense. Adele grabbed our fire extinguisher and it was thrown up to me. I’d never used one before but very quickly worked it out and began giving the Motorhome a foam bath. It worked fast but this stuff went everywhere. On the roof of the Motorhome there was powder residue all over it but the gift kept giving when we got back inside, it was all over our bed and all throughout the Winnebago. 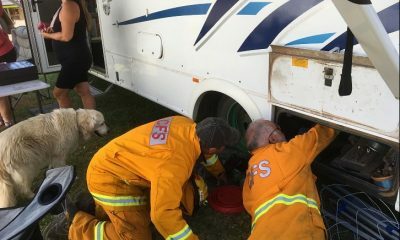 It was obvious the fire was contained to just the air conditioner unit for which I was thankful, no damage at all to the Motorhome or the roof. 18 months later now and the air conditioner has been replaced, twice actually, but I’ll discuss that in a minute. Matt was out fishing with our mate Mick in his boat so we had Mick’s wife call him to get the message through to Matt to come back. The Fire Brigade was called to check everything and gave it the thumbs up. They looked right over everything and told me they believed the compressor had shorted and that did made sense. So here we were, Easter Friday, nowhere to go, no-one to speak to about repairing it until Tuesday when shops opened again. Foam was everywhere, inside the Motorhome as well as outside. 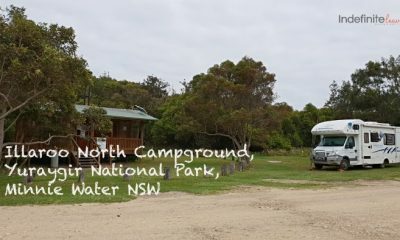 We were the talking point of the Campground and for all the wrong reasons and photos began being posted on Instagram of our Motorhome on fire. The people there though were fantastic and very helpful. Why the air conditioner decided that moment for the compressor to short out we don’t know. We were thankful it did do it then, when there were so many other people about to notice it, This also meant there were others to help us to put it out properly, rather than just days before when we were free camping in isolated locations around Kangaroo Island. Here’s what I do know though!! End of the drama you’re thinking? NoNoNo, it was only just beginning. The air conditioner that had been in our Motorhome was wayyyyyy too small and therefore was working too hard when it was used. It only barely cooled the Motorhome down when it was on and it was a hot day. We bought our Motorhome second hand and it came with a Dometic B2200. It looked to be the original air conditioner unit but there’s no way for me to know for sure. What I do know is that the B2200 Dometic Air conditioner unit is designed for a 5m vehicle and was too small in capacity for our Motorhome – http://etime.com.au/appliances/air-conditioners/dometic-b2200-pop-top-roof-mounted-air-conditioner.html. I didn’t know about all this until afterwards when I did some research. Fortunately, we did manage to get on to our insurer CIL straight away the next day, they were awesome even though it was Easter Saturday. We decided to go see CaraRest in Adelaide and arrange for them to do the insurance work of replacing the air conditioner. Soon after Easter we were due to fly back home to Brisbane as I was the MC for my nieces wedding. This meant we could leave it with them for the 10 days while we were away and they would have plenty of time to see to the repairs. When we dropped off the Motorhome, the owner of CaraRest said to me he would be installing a Dometic Harrier air conditioner, the model suited to our Motorhome. It was 10am and our flight was 4pm, thankfully we had plenty of time because 40 minutes into our taxi ride, when we were almost to the airport, I realised I left my wallet back in the Motorhome. Without my license I had no identification to show at the airport, so we had to turn around and go back to the Motorhome. When I arrived the owner’s daughter served me and took me out to the workshop to the Motorhome. They were already working on it so I jumped in through the open side door to the back of the Motorhome and reached through into the front cabin, grabbed my wallet and we were back on our way. During the week I followed up with a phone call to the Owner to check on progress, yes everything will be ready by Friday, the day before we were due back to pick up the Motorhome. Again on Friday, I rang to check on progress and was assured it was almost complete, it would be ready when we got there on Saturday. Ohhh and by the way he said, we couldn’t fit that Air conditioner, the solar panels on the roof were in the way so we put in a B2200 Freshjet. I figured he knew what he was doing so ok, see you Saturday. When we arrived the Motorhome was brought around to us. It was 11.30am and they closed at midday. The owner stood there with his pad and biro watching us while we all had our suitcases and luggage in our hands, over our shoulders and basically our hands were more full than a centipede’s sock drawer. Given he showed no signs of opening the door, even if it was for a lady with her hands full, Adele decided to open the door to the back of the Motorhome and when she did the handle just fell off in her hands. We all stood there wondering what was happening before asking what the deal was. The Owner immediately responded that Adele had applied too much pressure and broke it. A few minutes back and forth, I just wanted to get into the Motorhome and put down the bags. We knew what we were being told wasn’t adding up because one thing he said was they never used the back door. That seemed so odd, that they would lug their tools and an air conditioner unit over the front seats, squeeze their way between the two front seats, over our Waeco 40L fridge/freezer which at that time sat between our seats to access the rear of the Motorhome when there was a perfectly good side door. Besides, I had to come back to get my wallet remember and guess which door they had opened. I went inside and looked at the air conditioner unit and straight away it looked odd. It was clearly much smaller in size to the previous one and that one hardly worked as it was. Quickly I googled it and found out it is made for a space of 25m3 (we are 49.5m3) and a vehicle of maximum length of 5m (we are 8m). Our Motorhome is W2780 x L8000 x H2230 internally giving a total approx area of 49.5m3. I asked him about it and he just said the one he wanted to put on wouldn’t fit and he put a like for like on it. He insisted that was all he had to do. At no time were we angry or swear etc, we simply asked questions and believe we made valid points such as why didn’t he call me to discuss options before deciding not to install the one he said he would. It was at this point he decided to yell at us to leave and walked off and slammed the door to the premises and locked it. Did that reaction suggest he was feeling guilty about something, I guess only he could answer that!! Here we were with a broken door handle plus an air conditioner totally unsuitable to our Motorhome. It was a Saturday and again the Monday was a Public holiday so we had to wait 3 days before we could get answers to the issues. We were ready to leave for Uluru but had to spend more unknown amount of time in Adelaide. Before leaving, we rang CIL and told them what we knew and asked do we take possession of the Motorhome to which they said yes. So back to Rapid Bay we went for 3 more days. Lets just say, we will never darken the doors of that company ever again and I highly recommend you don’t either. By this time we wanted to leave Adelaide, we were pretty shattered and were looking for some positive experiences. It was also by this point we had run out of funds, nothing left, zip, zilch, zero. The stress was starting to tell. We spoke to CIL on the Tuesday and they said obviously we didn’t want to go back for them to fix the repairs and we confirmed we didn’t want them anywhere near our Motorhome. We said there was no point testing the air con in Adelaide in 22c cool weather, it will always seem cold. So they agreed we should leave Adelaide and arrange repairs further up the road, maybe in Coober Pedy or Alice Springs. The door handle worked from the inside, just not the outside. As we drove out of Adelaide just an hour or two…. Boom!! One of the tyres disintegrated and blew out. It was one of the rear dual wheels so we limped into the nearest town just nearby, a place you’ve probably never heard of called…..Snowtown!! Needless to say, we weren’t thinking an overnight stay here was something we were looking forward to. If you’re unsure what I’m talking about, just google Snowtown. Our headspace was already very ordinary, this felt like another blow. I kept telling myself, this is a test, the universe is asking me how much do you really want this life? My business for reasons I couldn’t understand just wasn’t happening. I was doing a lot of work but contracts kept crashing and I was left without being paid anything for all my time and costs. Instead of the normal 1 in 5 contracts not proceeding on finance or other issues I had lost 8 out of 9 contracts while travelling. Each one that crashed was a dagger in my back and totally unexpected. Financially, we were now having to go into debt to continue. This was when we became super awesome at travelling on a budget. Only very few people know about this dark time we went through, that is our great friends we had met and travelled with and were keen to catch up with again. Jason, Denise and little Millie from the Facebook and Instagram page West Aussie Nomads and Mick, his wife L and their 2 boys all of whom we now proudly call great lifelong friends. We didn’t discuss details with any family or friends back home, we didn’t want to worry them when they were so far away. Luckily we had been doing this long enough now to know there were going to be great times again, we just had to get through it. We got ourselves to Darwin and went to see Paul who does Mobile Caravan repairs there and he was sensational. He showed us a caravan he was renovating and it was probably half the size of our Motorhome and he was putting a bigger air con in it, the B3200. Also he said he hoped the Insurers wouldn’t want him to keep the one installed in ours as it was so small he’d never use it. Once he spoke to the Insurers and provided other really damning evidence and opinion, CIL backed us up entirely, organising the Harrier air conditioner to be installed plus replacement of the door handle and we were told the cost of it was sent back to the original repairer. Whether that is what happened I’m not privy to but it’s what we were told. Needless to say, CIL’s representative told us they were very disappointed with the original repairer. There’s a comment made by two people within the industry that reflects so poorly on the original repairer that I’d love to share but it’s opinion and not fact, so that one you’ll have to ask me about if we meet one day. We had the air conditioner replaced in a day, yes the solar panels had to be re-positioned but it was obviously easily done and could have been done originally, and a new door handle was installed. That was a huge relief but the Travel Gods decided we needed one more devastating blow, the time to make a call on our beautiful Golden Retriever MACKS. It was time to say goodbye. Now we were truly shattered, our souls were basically destroyed. Let me tell you, this is so hard to write, tears are beginning to flow as I go back in time to share with you about this horrific two month period of our life on the road. They were cruel times. The repairs were completed and we’ve had no issues with them since. We went heavily into debt and had to spend some time back in Brisbane getting control of our finances again. Therefore we headed home for Christmas and spent 4 months focused solely on getting back on track. Just when we got back in front we had to replace the rubber membrane of our roof in the Motorhome and that blew $8000 and left us with no surplus cash once again. It had been fun times…. not!! We honoured MACKS in every way we could think and today the Motorhome is called Darwinny, in remembrance of her and her resting place. She will always be part of Indefinite Leave and her collar, mat and lead stay with us. We thank our great friends we mentioned for getting us through. More importantly, we have remained mates and catch up often and they feature in our next book coming out soon. We look forward to introducing them to you. We can’t thank Paul from Pauls Mobile Caravan Repairs enough, he really knew his stuff and couldn’t have been better to deal with. Contact Paul on 0438 120 571 if you are in Darwin and need any help. Also we remain very thankful to CIL for what they did for us even though we are now with a different insurer. To everyone who followed our journey on our pages and offered us a friendly comment, chatted to us, messaged us and inspired us to keep going, and there were so many, thank you, you really don’t how much you helped us through that journey of our adventure but we sure do. Our Blog became our place where we could go, put on a brave face and share positive thoughts and get back more in return. Now go check your Fire Extinguisher, check it is accessible, in good working condition, isn’t out of date and all of you know how to use it, it may save your vehicle or even your life. There’s nothing better for the soul than travelling. It opens our eyes, our minds and our hearts. The big choice to make is whether to head overseas or explore our own country. There’s so much to see in this world, but here’s 10 great reasons to Travel Australia first. The Aussie dollar is too low to be over excited about heading overseas. Unless you’ve got to know our own beaches, why go overseas to see there’s? We really do have perfect weather here. 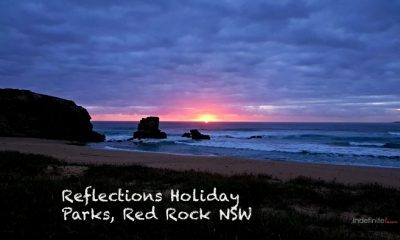 Head north for winter, south for summer and be anywhere in Oz for Autumn and Spring. 5. You will meet really interesting people. We have met some of the most inspiring people on the road. One example was John, the 72yo former teacher and sheep farmer. I got talking to John for 3 and a half hours around the camp kitchen BBQ in Katherine. Fascinating guy and hard to believe he had left Perth, been to Melbourne and was now in the NT travelling at his age…….. on a Motorbike. John is just one of many wonderful people we have met on our adventure. There’s so much about our own country’s past just waiting for you to discover. The setting sun in 1770, Darwin and Broome just has to be seen. I could name so many more places including most of the WA coastline but I’ll let you discover some yourself. 8. Better for our economy. We hardly manufacture anything anymore, mining took a nose dive so therefore Tourism is becoming a vital industry for our economy. Let’s spend our money here and give our kids jobs. Travelling Australia almost guarantees you will make a whole lot of new friends. Your kids will grow enormously and learn on the road. They will thrive by spending genuine quality time together as a family. This post may contain affiliate links. If you buy something through a link on this page we may receive a small commission. It will not cost you any more but it might help us put some fuel in the tank. Thank you for supporting us. There’s a lot to think about regarding what to take on your trip around Australia. No need to stress about it, we’ve made the list here for you. Space and Weight will quickly prove to be your enemy so pack smart, pack light and limit it to only what you really need. Of course, you may have other things you need to take and you may not need or want everything on this list but it’s going to give you a very comprehensive starting list to ensure you don’t forget anything. Remember to pack the minimum you need and don’t exceed your weight limits. To purchase any products for your trip you can use any of the links below.